There’s lots of fancy and expensive software you can use to edit video. Oftentimes, the many steps and $$$ required excludes a lot of people. But there are video editing tools that are available to anyone with a computer and an internet connection. Like youtube! Log into the google account listed on the sheet inside your envelope. Create a new video merging at least three of the videos you see listed in the youtube channel. Edit the videos you’ve chosen. You can trim the videos by dragging the left or the right side of them. You’ll need some buffer room on either side of them if you want to use transitions! It makes them overlap slightly. Add transitions, text, and/or other effects. If you want to, add a soundtrack. Put your name in the title of your video so you’ll be able to see which one’s yours! When you’re happy with your video, press the create video button. Tweet your video using the hashtag #digitalacademy! Remember how you thought about something on the library’s website that you’d like to show a brand new student? Something that would be useful to them? Use Quicktime to create a screencast less than 1 minute long showing students how to do one thing on the website. 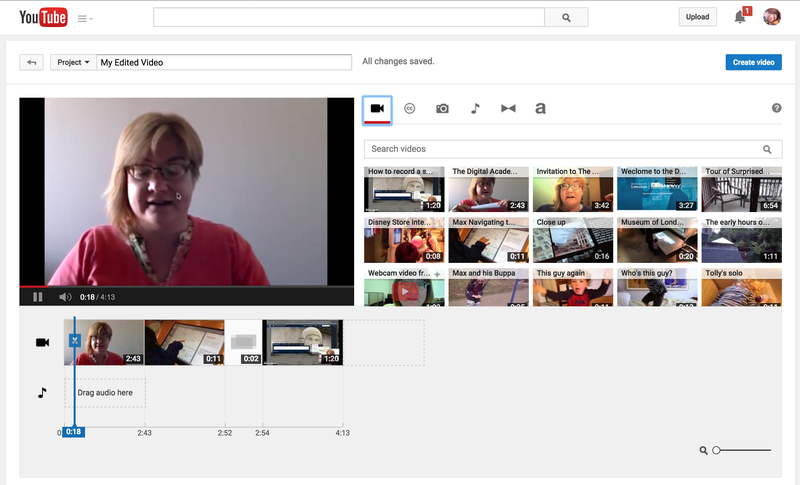 Upload your screencast to youtube using the username and login on your card. Tweet your post using the hashtag #digitalacademy! Log into google using the username and password on your card. Click the “create” button under photo slideshow. Make a slideshow! Choose your own pictures, or anyone else’s pictures! Mix and Match! Pick a theme, if you want to! Or don’t! Pick a soundtrack! Tweet a link to your slideshow blog post with the hashtag #digitalacademy! This week and next, I’m delivering a three day tech program for library staff called The Digital Academy. I’ve been using this blog to post a lot of the support materials for it, but I haven’t posted the entire thing. Here’s the pre-work and schedule for day one, which focused on text. This is the generic version. Feel free to take and modify it! The Digital Academy, day 2: Is there such a thing as too many animated gifs? With your partner, make two reaction gifs based on the emotions listed on your cards. The orange card is the positive emotion card. The blue card is the negative emotion card. Be as creative as you like! Select “Create gif from webcam.” What this does is give you an interface where you click the “add frame” button for each image in your gif. You click it a bunch of times to make the animated movie. While it’s easiest to do this with a webcam, you can also take a bunch of screenshots, like doing old school animation, and create a video that way. That means you can create one of these for web instructions, too, like how to use a database or how to search the catalog. If you’ve got time, give it a shot! You can do this as you like: you can both emote at the same time, or one person can control the computer while the other acts, and take turns, or you can find another way to communicate these emotions and portray them using the gif maker. Whatever you like! As long as you create two gifs that match the emotions you’ve got and post them! Check out the settings, see what they do. If you want to start over with the gifmaker, just reload the page. Save your completed gifs to your computer, then post them on your blog. Tweet your finished creations with the tag #digitalacademy! Retweet your partner’s gif, too! Welcome to the Digital Academy! And select your sandwich of choice for lunch! Explore Scalar: what can it do? Work with your colleagues! Tweet a link using the hashtag #digitalacademy. It’s gotten very easy to publish text; you can write a blog post, post an article, and you can even make your own ebook. Feel free to explore the templates and options! You can make it as simple or as complex as you like. Once you’re happy with it, upload your ebook into this box folder. The brilliant thing about text on the internet is how easy it is to publish it, comment on it, and share it. Medium is a posting platform designed to make it easy to publish long-form articles as simply as possible. They’ve taken the idea marginalia and made it a reality. The point of Medium is to focus on the text, without all the bells and whistles. You’ve probably read a Medium article before without knowing it; Medium is about the content, not the platform. Go to Medium. Sign in using your twitter account. Read this article. Add a comment in the margin! Add your Wordle and/or Voyant images to your article. Post a link to your article on twitter with the hashtag #digitalacademy. All done with Hemingway and Wordle? Try Voyant! Voyant is a digital humanities tool for analyzing text. It’s more complicated than Wordle, and doesn’t pull out definite articles and other common words by default. You need to tell Voyant exactly what you want it to do. Scholars use this tool to analyze large blocks of text, like the complete works of Agatha Christie, or the complete works of Shakespeare. Paste your text in Voyant. Explore. Paste all our text into Voyant. Explore. Take screenshots and post them to your blog. Tweet your screenshots using the hashtag #digitalacademy.